The book, written by two experts in the area of big data, gives an exciting introduction to what Big Data is and how it has changed the world around us. The book throws interesting examples that along with being interesting also showcases how big data have been utilized till date. The book explains a shift towards an increased production usage of large nearly complete population levels data sets in the management and control of a range of industries. There are three facts expounded in this book – first, because big data makes storing and retrieving of large amount of data so cheap, businesses now are able to store all the data that they can lay their hands on. This has lead to the almost demise of the earlier high fashioned sampling techniques in data analysis. Second, since it’s all of data that now we can work on and analyze, messiness in data is allright. We do not and should not really bother and spend resources on data cleansing, as was done when we had just a sample of data. Third, the authors propagate the fact around datafication i.e. since we can store a large amount of unstructured data cheaply; there is an added emphasis on collecting data from sources that we previously ignored. Also, the authors emphasize on correlation between things rather than the older concept of causality or why things happen. But having said this, the book went on to repeat itself after first few chapters. Also, it gives a good introduction to big data with valid examples but the ideas stopped there. 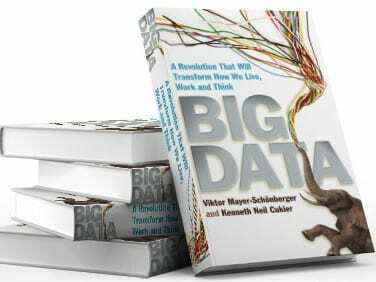 What’s next and how things are going to evolve with big data is not so much touched in the book. If the reader is an industry practitioner on big data, the book does not offer much. Yet, it’s still worth reading with lots of interesting stories and maintained a good balance of technical and entertaining perspectives.